Which metrics can best help a destination marketing organization (DMO) make good decisions and demonstrate its value? Without having the right corporate measuring tools, you as a DMO decision maker risk starting down a path that could negatively impact the future of your DMO, your funding, and your industry. Healthy strategies, objectives and priorities should stem from the most reliable, relevant data available. Destinations are often held accountable for increasing visitation and the resulting economic impact. At the same time, however, visitation is affected by a whole host of factors that extend beyond a DMO’s control. A bad economy, severe weather, global unrest, and political decisions are just a few examples of factors that can dramatically impact when and how people choose to visit. Given this confusion, it’s necessary to help politicians, tourism board members and other stakeholders understand the true value of a DMO’s efforts. Your DMO can best communicate its value by focusing on measuring the aspects of travel that a destination can control. Today, the stories visitors tell affect how a destination is perceived more than anything else. These stories are based on their experiences in the destination. Since every visitor influences perception by word of mouth, working to improve the destination experience is the only way to properly manage a destination brand. A DMO must measure the destination experience at a macro level so that it can be easily reported, understood and acted upon. Net Promoter Score (NPS) is the perfect tool to achieve this. 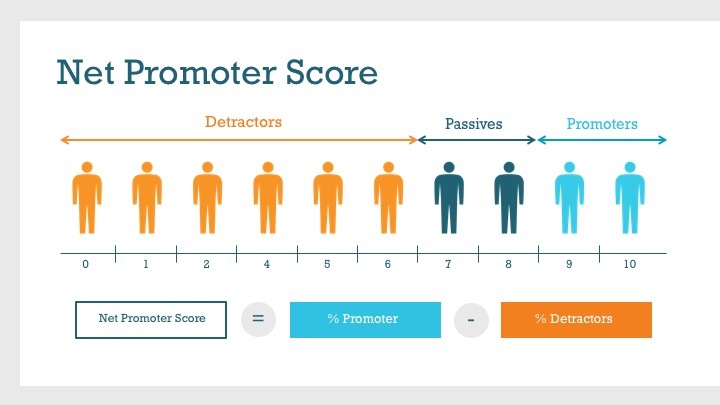 To find your Net Promoter Score, simply subtract the percentage of detractors from the percentage of promoters. Destination British Columbia is among the DMOs putting this into practice today and has described how the formula is used in greater detail. Research has shown a strong correlation between Net Promoter Score and business growth – where one increases, so does the other. An NPS survey is relatively simple to implement. By including the right follow-up questions in the survey, your destination can slice and dice the information in multiple ways to find deep insights into the strengths and weaknesses of the destination experience. By creating benchmarks and measuring this over time, you will discover ways to improve visitor satisfaction. Best of all, by making an improved NPS score a corporate goal (and by extension, an industry one as well), you are able to set the right objectives and priorities. And isn’t that the point? After all, destinations are in business to give their guests a remarkable experience that will leave them with great memories to take home. NPS can help improve the destination experience, but how can a DMO measure the impact of its promotional activities? Since a DMO typically operates early in the path to purchase, its messaging is often disconnected from the final sale. This makes it hard to find concrete evidence that promotion has had the desired economic impact. In recent years, an unwieldy basket of KPIs has appeared, each serving as a proxy for success. These KPIs include website visits, the size and reach of social media channels, referrals to industry websites and many more. These measures are important to keep an eye on because they can tell you if your strategies are working, but they don’t translate easily to stakeholders. These technical numbers are sometimes meaningless to politicians or board members who are often most interested in dollars and cents. Earlier this year, in collaboration with six international DMOs, Destination Think! launched the Potential on Investment (POI) formula as a new way to measure the effectiveness of a destination’s promotional efforts with a dollar value. The POI formula is a framework that measures the potential financial value resulting from social media activities. It normalizes the value of a consumer in a destination (Cv), the impact of a social media channel (Ci) and measurable proof of consumer engagement (Mq) into a single number that represents the dollar value of a DMO’s promotional activities. Currently, the focus is on social media engagement, and further research and collaboration in underway to include more channels and markets in the future. Just like Net Promoter Score, the Potential on Investment formula allows a destination to measure and benchmark data over time. They are both easy to understand, implement and calculate. The two metrics provide the best possible evidence to help decision-makers plan for the future and make the best choices about future funding and priorities. NPS and POI help demonstrate the true value of an investment in destination marketing. Click here to download the Potential on Investment whitepaper and calculator, receive updates and participate in future versions of the formula.